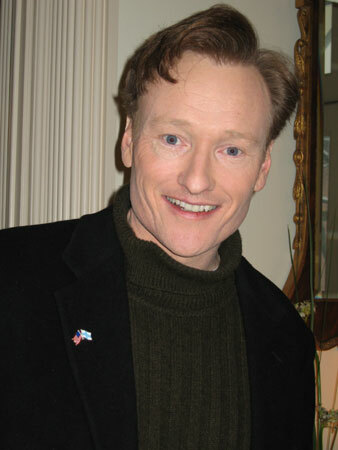 Today I found out that Conan O’Brien spent two years as a writer and producer of The Simpsons before replacing Letterman as the host of Late Night. After becoming burnt out working at Saturday Night Live, Conan quit and decided to do something else, though he had no idea what. When Mike Reiss and Al Jean from The Simpsons heard about it, they called him up and offered him a job, even though he didn’t really have any experience writing sitcom scripts. On his first day of work, he showed up and they showed him into this office and left him to jot down some episode ideas. When he left for a coffee break a few minutes later, he heard a crash and walked back into the office and there was a hole in the window and a dead bird on the floor. This happened within 10 minutes of him arriving at his new place of work. Nice omen! After two years of working on The Simpsons, he got the job as the new host of Late Night on NBC. Fox tried to force him to stay as he still had a year on his contract with them, but he ended up being able to get out of it when NBC paid Fox half the value of Conan’s salary that year and Conan paid the other half. Seems like NBC is often paying to end Conan’s contracts prematurely. Matt Groening, the creator of The Simpsons, named many of the characters after his own family such as: Homer (his dad), Margaret (his mom), Maggie and Lisa (his sisters), and Abe (his grandfather). His brother Mark was the inspiration for Bart. He chose to name the character “Bart” though, because it was an anagram for “Brat”. Matt Groening’s last name is pronounced “Grain-ing”, not “Grown-ing”. The couch gag in The Simpsons is used to make the show longer or shorter depending on the length of the episode itself. The average couch gag lasts about 6 seconds while the longest to date lasted 46 seconds. Marge’s middle name is Juliet; Bart’s middle name is Jo-Jo; and Lisa’s middle name is Marie. Matt Groening voices the sound of Maggie sucking on a pacifier. Lisa has celebrated her 8th birthday on two different episodes. Bart is voiced by a woman, Nancy Cartwright, who also does the voices for Nelson, Ralph, and Todd among others. In the opening credits of all the episodes but one, Maggie is listed as costing $847.63, which was the average monthly cost of caring for a newborn baby at the time of the show’s inception. In the one episode where she doesn’t list as that price, the register reads NRA 4EVER. The voices done by Hank Azaria are based on people he has known in real life. For instance, Lou is based on Sylvester Stallone. Comic Book Guy is based on Azaria’s old college roommate. Chief Wiggum is based on famed actor Edward G. Robinson. Dr. Nick is named after the doctor that prescribed several doses of narcotics to Elvis Presley. In the Arabic broadcast of The Simpsons episodes, Homer drinks soda instead of beer and eats Egyptian beef sausages instead of hot dogs. The character of Moe Szyslak was based on Louis “Red” Deutsch, a bartender who was infamous for his profane tirades against prank calls in the mid 1970’s. The Simpsons has only six main cast members who do the voices for almost all of the characters. No mention of Ms. Crab Apple?